A certain French automaker wants to help. 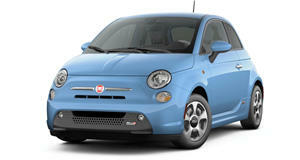 The only all-electric vehicle Fiat Chrysler currently sells in the US is the underwhelming Fiat 500e. It’s no longer competitive. Developing dedicated EV-only platforms is also anything but cheap, and Fiat Chrysler would like to share the costs with another automaker with similar interests. According to Bloomberg, that automaker is the PSA Group, comprising of Peugeot, Citroen, and Opel, among others. The two automakers are reportedly in talks regarding a partnership to develop a so-called "super platform” that will likely underpin a range of future EVs. Previously, there was a rumor claiming the two companies were holding secret talks regarding a merger, but various factors seemed to have determined that’s not feasible, at least right now. Renault-Nissan is also said to be talking to FCA about this same issue. But FCA and PSA both share a common interest in electric vehicle expansion and a global platform is required. The two could also collaborate on self-driving technology. Furthermore, FCA would like to expand its European presence. "PSA could provide FCA with a solution and a future in the region,” one industry analyst said. Peugeot already appears to be well on its way to making a North American market comeback. But the main commonality is electric vehicles. Global automakers from different continents have also announced recent collaborations for EVs and related mobility technologies. In late February, BMW and Daimler announced their plan to jointly develop automated driving technologies while Ford and Volkswagen are partnering up to co-develop commercial vans and medium-sized pickup trucks. The latter pair haven’t closed the door to EV cooperation as well. FCA and PSA discussions are still ongoing but given the mutual interests, a deal could be made sooner rather than later.